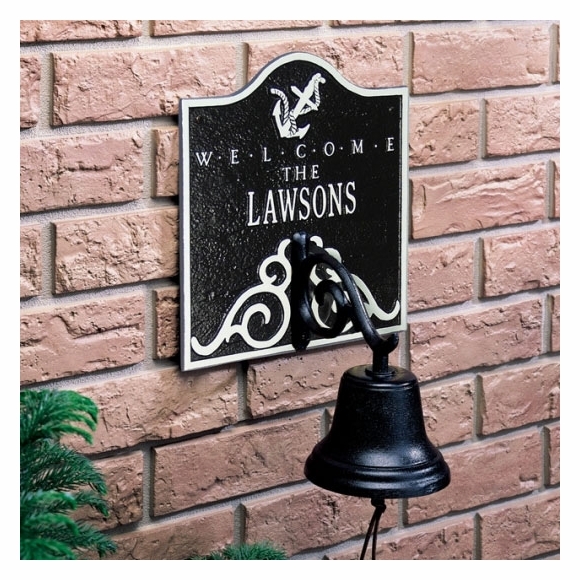 Nautical Welcome Plaque with Bell - - wall mount 10.5" x 11.5" personalized welcome sign with an 8" working bell. Arch shape. Made in USA. Anchor welcome sign with bell. Lighthouse welcome sign with bell. One line of personalization holds up to twelve 1.25" characters (including any spaces and punctuation). Note: If you want to use an apostrophe in your name (as shown in the black with gold sample), be sure to include it in the input box. Color combinations: BG black plaque with gold characters; BW black plaque with white characters. Dimensions: 10.5" x 11.5" plus 8" for the bell. Personalized anchor welcome sign or lighthouse welcome sign. We are very satisfied with our Nautical Plaque with Bell purchase. We had to contact customer service about our order and we received prompt and friendly service. The plaque and bell are high quality and exactly as pictured on the website. We have received many compliments and will definitely purchase from Comfort House in the future.